These maps provide a context for the archives. Maps 5 and 6 are scans of historic maps from Arley Hall, dating from 1744 and 1786 so covering the period from which many of the archived documents originate. 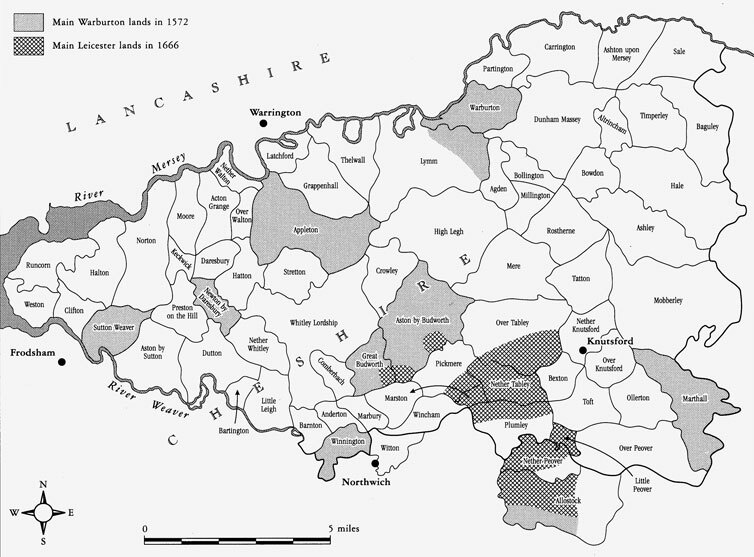 This map shows the main estates of the Leicesters and the Warburtons. On the southern edge, Witton, Nether Peover and Allostock are in the Northwich hundred and Winnington in the Eddisbury hundred. The hatching shows the approximate proportion of each township owned, not the actual area.